Finally a Cruise Critic Packable Jacket! This lightweight 100% nylon taffeta jacket folds so compactly, it will take up just a little space in luggage or bag. 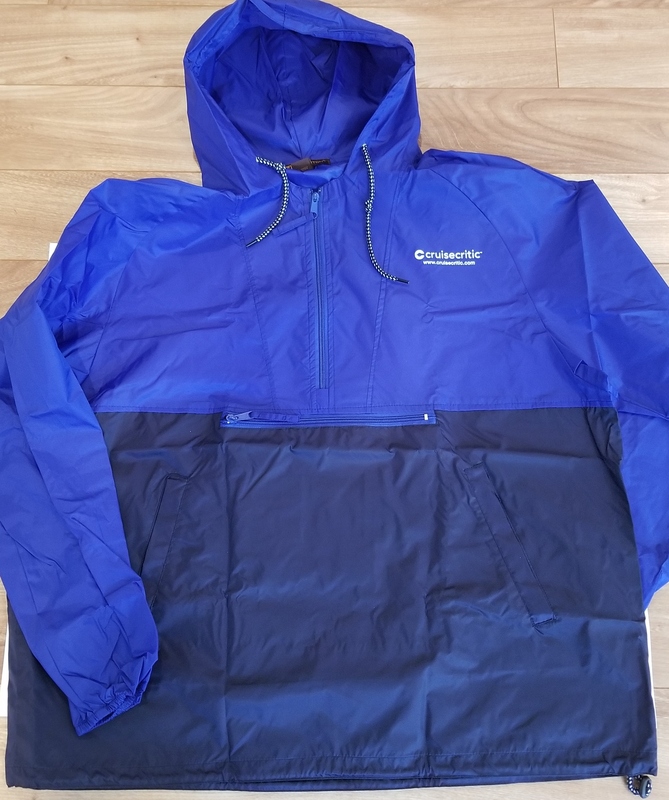 When wearing it, store lots in the windbreakers large front zippered pocket: wallet, passport, iPod, cruise key card, sunglasses and more. It's perfect for travelers and tourists when they are just not sure how the weather will be -- also a great head pillow or lumbar support pillow! This wind and water-resistant jacket protects you while sightseeing on a rainy, gusty day. It includes a hood, hem casing with drawcords, and elastic cuffs for added protection, plus side pockets for chilly hands and more storage. The coat has loops, so it can even be attached to and carried on a belt when packed into itself! The pullover jacket features a 1/4-length zipper with the Cruise Critic logo embroidered on the left chest. Feedback from someone that ordered this item: As for the jacket, it was PERFECT. I used it constantly; took it everywhere in case of rain. It is wonderfully portable and handy. I loved it. One local even asked me if I was a 'cruise critic' who reviewed ships since I was also carrying a Cruise Critic tote bag. How funny! The jackets run true to size. If you wear a large, the large should fit you. Get a larger size if you plan to wear it over something.